Buchanan & Buchanan • Why Is My Newborn Baby’s Head Being Cooled? Why Is My Newborn Baby’s Head Being Cooled?. Buchanan & Buchanan. Why Is My Newborn Baby’s Head Being Cooled? Most parents remember the birth of their baby as a most joyous experience. It is then end of nine months of preparation, anticipation, and eagerly waiting. Becoming a parent is a festive celebration. But what happens when the birth of your child does not go exactly as expected? What if after the birth of your baby the healthcare providers inform you that your newborn baby requires brain cooling? We are here to provide you the answers to the why, when, how, and what surrounding brain cooling of a newborn baby. What does brain cooling treat? Brain cooling or brain hypothermia is a treatment for hypoxic ischemic encephalopathy (also known as HIE). HIE is a brain disfunction caused by a reduction in the supply of oxygen to the brain and other organs (hypoxia), compounded with low blood flow to vital organs (ischemia). Encephalopathy refers to any condition that results from reduced blood flow and oxygen supply to the brain. There are many different causes of HIE, some which occur before, during, or after a baby is born. Without immediate treatment of HIE, a baby is at risk of severe brain damage or even death. HIE can lead to serious, long term complications and health conditions if not properly treated. How does brain cooling work? Brain cooling is a treatment that attempts to achieve and maintain a specific body temperature in a newborn for a specific duration of time in an effort to improve an outcome during recovery after a period of lack of oxygen or blood flow to the brain. Brain cooling is induced by cooling a baby to around 33.5° Celsius (or 92.3° Fahrenheit) for up to three days after birth. Brain cooling has been proven to be the only medical intervention which reduces brain damage and improves an infant’s chance of survival and reduced disability. Cooling alters the chemical processes in the brain, reducing the risk of permanent brain damage. When should brain cooling therapy begin? If your baby suffered HIE, cooling therapy should start as soon as possible after birth, but no later than 6-hours post labor, if possible. If the hospital does not have resources for cooling therapy, ice packs may be a suitable temporary method of cooling while transferring to a location that has a NICU department that supports therapeutic brain cooling. Although one would never expect for a bad thing to happen during birth, it is important to inquire whether the hospital you intend on delivering your baby has cooling therapy capabilities. What are the benefits of brain cooling? Immediately, brain cooling slows naturally-occurring processes that lead to permanent brain damage, such as swelling and brain cell death. Long term benefits include survival of the baby and in future adolescent years, the child is less likely to develop permanent disabilities. 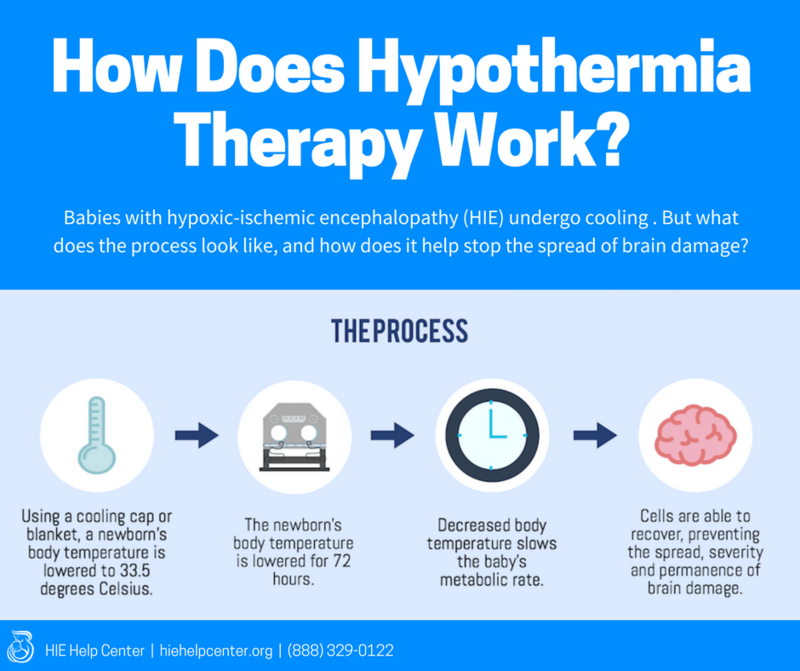 While brain cooling helps reduce neurological damage, it does not prevent secondary conditions associated with HIE, such as cerebral palsy, eye issues, hearing deficiencies, and motor delays. What happens after my baby’s brain is cooled? After brain cooling, a baby will be monitored and assessed to ensure he or she can eat, digest, and function. Several tests, such as MRIs, EEGs, and heart monitors should be expected. In most cases, after cooling, if a baby is able to feed, digest food, and have regular urination and bowel movements, he or she will be discharged home. Just because your baby’s brain is cooled, does not ensure he or she will not have resulting injury. Brain cooling has been shown to improve babies’ outcomes, but it is not a guarantee. What should I do if I suspect negligence caused my baby’s injury (HIE)? Perhaps your newborn has been cooled right after birth. If you or someone close to you recently suffered a difficult labor or delivery and injury to the newborn that resulted in brain cooling, act quickly to preserve evidence. The only way to determine if the injury was avoidable is to have prenatal, delivery, and newborn medical care attentively reviewed by qualified professionals who understand the complex physiology of mother and fetus during gestation, stresses the baby undergoes during the birth, mechanisms to cope with the stresses, adjusting the newborn to life outside of the womb, and requirements and responses to stresses and factors in the environment. At Buchanan & Buchanan, our combined legal-medical team has decades of experience handling medical malpractice cases, especially birth injury and birth trauma. We have experienced medical professionals on staff to talk with you right away and review your claim. We quickly and efficiently to assess the medical facts and take immediate action to protect your rights. And, if we find malpractice caused injury, we will take the wrongdoer to court to secure fair and just compensation for the injured child.